Last Tuesday I went to the AdvTech full-year results presentation for the period ending 31 December 2017. I will look at the numbers excluding the once off fraud impact. A financial manager syphoned off R5m over a period of 3 years. In that process, revenues were overstated and costs understated. Management is confident that the issue has been dealt with. Revenues for the period increased 22% to just over R4bn. Trading profit increased 20% to R671 million, this resulted in normalised earnings per share growing 20% to 75.8c. Currently trading at R15.30, the stock affords a historic PE of 20 times earnings. That gives the share an exact PEG ratio of 1 which seems about right. Cash flows before CapEx came in at R597m which is 15% of revenues, which is solid. This came from having 60 176 students attending their 117 facilities. In 2018 they expect to have 63 544 students in 122 facilities. If you include their remote/online learning brands, they will have 92 475 students within their systems. Let's take a closer look at the three main parts of this business. 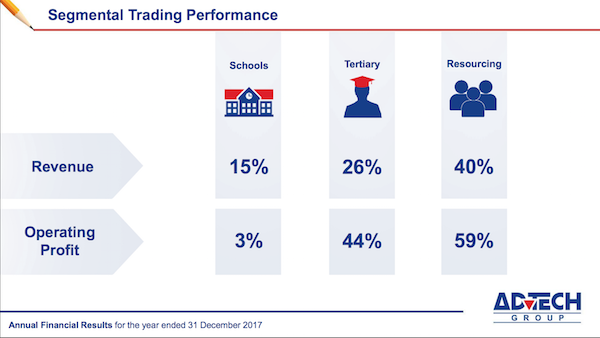 As you can see from the image above, the school's division had a tough year as far as operating profits are concerned. But that was because management is reinvesting funds heavily in the future. Naturally, that has a negative impact on margins. During the year they bought five existing schools, made five site acquisitions, built three new schools, as well as improving existing facilities. Their main focus is on academic excellence. They feel that even though demand is great, their standards, especially compared to private competitors, are crucial for long-term sustainability of the business. I agree. As of February 2018, they had 27 400 school students enrolled. Their existing capacity is 33 000 and their ultimate potential site capacity is 45 200. Their current occupancy sits at 61% of this overall number which is unusually low. That also has to do with their added capacity which has not yet been filled. Remember they have to wait a full year to fill these new facilities. It is difficult to fill spots of mid-year leavers. Of the 1 588 students that left last year, 43% came from financial difficulties and 29% came from emigration. 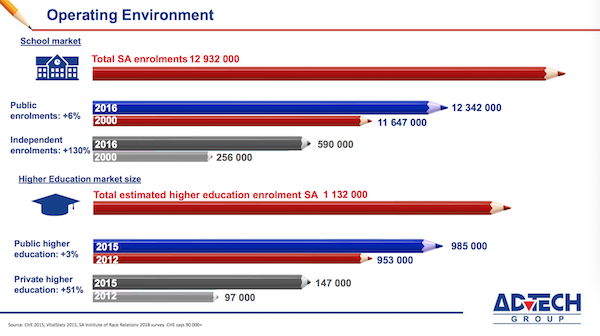 However enrolments remain strong and as those pick up, operating profit growth benefits even more. For example, a 2% growth in enrolments would result in a 13% growth in operating profits. This is why they continue to expand capacity. Tertiary had a great year, growing revenue by 26% and operating profit by 44%. They made two acquisitions during the period. The Private Hotel School, and Capsicum Culinary Studio. They are putting these two schools together at a new hospitality campus in Rosebank. I like this trend; tourism is a fast-growing sector in South Africa. Rosebank College, which is their lower fee tertiary product, has established some nice recruiting relationships with some big blue chip corporates. Rosebank College not only teaches it's students degree content, it also trains students on how to get a job within corporate South Africa. Varsity College which is their premium brand continues to thrive. Vega, South Africa's leading creative educator, continues to churn out world class qualifications in brand management, digital marketing, creative design, gaming, fashion and interior design. All service sector based jobs in industries that are growing. AdvTech has a big first mover advantage in tertiary education. We feel this will continue to be the gem of the business. Despite a tough environment, Resourcing did a great job. Revenue grew 40% and operating profit grew 59%, admittedly off a low base. They have good relationships with hiring companies and of course thousands of qualified students being churned out by the tertiary division. The Macro environment remains positive for AdvTech. Roy Douglas, the CEO, spoke about how resilient they have been during a very tough economic period. He thinks there may be a lag in the benefit experienced form a positive economy but I feel a growing middle-class in South Africa would be extremely positive for AdvTech. They also have a nice relationship with a large property development business called Rendeavour. Rendevour are building new cities in the outer rings of highly congested African capitals such as Nairobi and Lagos. AdvTech will operate the school within this new city. They are already opening up a Crawford International just outside Nairobi later this year. The image below looks at the educational operating environment. As you can see, there is still a massive role to be played by the private educational businesses. We remain positive on AdvTech. The demand will remain strong, the business just needs to implement its strategy effectively. Maintaining academic excellence and growing capacity to meet the demand. The team seem to have this well under control. The share price has been dormant for the last 9 months which we think is a great thing while we accumulate.